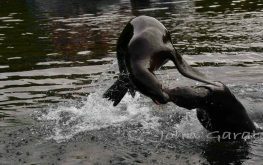 It is really up to you, as a land based visitor, how active or relaxed you want your Galapagos adventure to be. As part of our concierge service we can assist you in finding the right activities and excursions for you. 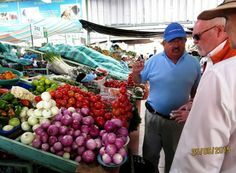 Every Saturday morning there is farmers market not too far from Torre Mar building. Locally grown produces are offered for sale as well as produce brought from the mainland. 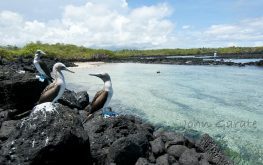 This gives visitors an opportunity to live like a local and meet some of the Galapagos residents. 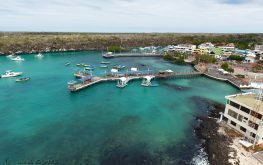 Located in Puerto Ayora, you can explore the Galapagos National Parks visitors trail and view the breeding center and Giant Tortoise pens. Where you will witness the various stages of development of these world-renowned, indigenous tortoises that outlive humans. While enjoying a close encounter with these impressive animals you will learn all about their fascinating life. You may also learn about Lonesome George, the last known Pinta Tortoise. 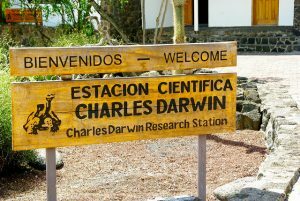 During the same visit you can also go to the Charles Darwin Visitors Center and view part of the CDRS collections and learn about some of their work. A recommended visit to one of the spectacular geological works of art, allows you to witness the dawn of this island around a million years ago. 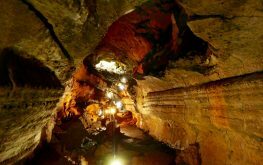 You can wander your way through the cavernous lava tunnels. There are numerous on Santa Cruz Island. Take a water taxi to the other side of Academy Bay and take the walking path to the Punta Estrada area. 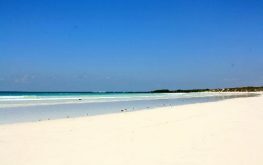 You will find a secluded white sand beach. 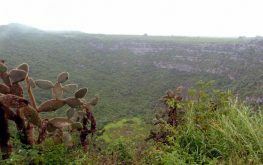 If you continue on the hike you will take yourself to Las Grietas, a volcanic formation were the seas pass through. This is an example of the islands born of beginnings, where lava met the sea. 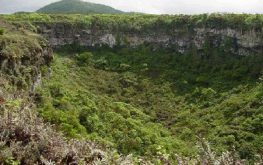 These large twin sunken craters in the highlands, referred to as Los Gemelos, are in the highlands of Santa Cruz. Weather permitting, visitors can choose to hike through the Scalesia forest, an endemic species of cloud forest trees, where you will also see a great variety of birds. Bird watchers who would like to spend more time here can arrange a special tour to this interesting habitat. 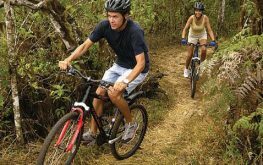 Mountain Biking on the Galapagos Islands is a dream for any avid biker. 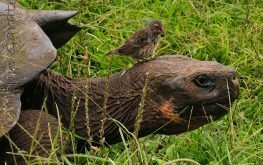 One of the top destinations in the world for adventure travel, the Galapagos islands offers up spectacular wildlife viewing, awesome scenery and an intriguing historical past that will satisfy any type of explorer. The bike routes in the highlands are quite varied and so are their difficulty levels and landscapes. If you want to experience a quiet peaceful nature walk right in Puerto Ayora Las Ninfas Laguna is a perfect spot. The laguna is feed fresh water from the cliffs and salt water from Academy Bay. You will find fish swimming in the laguna and a several species of birds in the mangrove trees as you peacefully stroll around the boardwalk. The nature walk on Seymour takes you in view of Blue footed boobies and nesting Frigate birds. 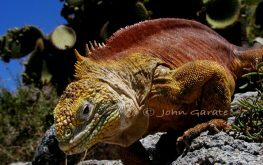 You will also view the territorial land iguanas on this arid island. Off shore in the waves it is a favorite location for sea lions enjoying the surf. This island excursion includes an island walk and snorkel. This is a must do in Galapagos. 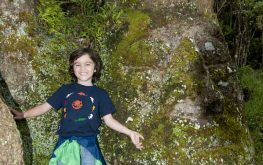 View and interact with giant tortoises in the wild, bird life, and lava formations. Enjoy a sit down lunch while overlooking the beautiful highlands of Santa Cruz. As a land based visitor Santa Cruz is the only island you can view tortoises in their native environment. The level of hiking will be your choice. Sombrero Chino is a small island just off the southeastern tip of Santiago Although the island is small, it has a beautiful panorama. 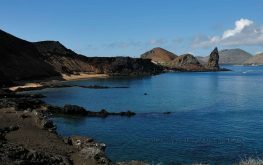 The 400-meter trail begins on a small, white-sand beach nestled in the sheltered cove between Sombrero Chino and Santiago. Sea lions and American oystercatchers often frequent this beach. The trail continues along the coastline of the cove, passing beside the island’s characteristic lava terrain and colorful pioneer vegetation of this new landscape. Glimpses of lava lizards, marine iguanas, and Sally Lightfoot crabs battling the changing tides. The trail ends at the island’s rocky shore, which is spattered with scenic tide pools lined with green algae and marine iguana passersby during the cool season. You can also swim in tranquil blue waters along the cove, playing with sea lions and spotting tropical fish. 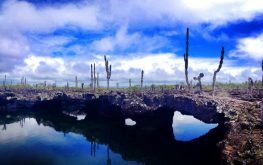 Santa Fe is one of the oldest Islands in Galapagos with volcanic rocks over 4 million years old. It is home to the endemic creamy colored Barrington Land Iguana. If you want to swim with sea lions Santa Fe is the island visit for you. Santa Fe is a favorite hangout for playful sea lions to swim in the surf. You get to view close up Sea Lions and their pups, Land Iguanas, Sally Lightfoot Crabs, and various nesting seabirds. 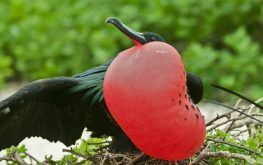 On the land walk, you can see Yellow Land Iguanas, Swallow-tailed Gulls, Red-billed Tropicbirds, Audubon’s Shearwaters, Nazca and Blue-footed Boobies, Frigates and more. 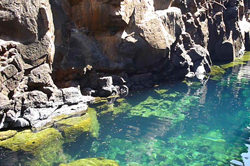 You will stop for a snorkel just outside of the Ithabaca Canal, a refreshing way to end this interesting day tour. 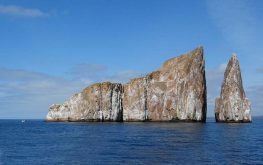 Pinnacle Rock is located offering one of Galapagos’s favorite views in the archipelago. It is also home to a colony of Galapagos penguins. You will have an opportunity to see some of the northernmost penguins. The tour includes an island walk to view the Pinnacle rock and snorkeling. This is a magical experience in Galapagos. You will go on a smaller boat than the traditional day tour boats to a remote pristine location for snorkeling and beach time. The crew will drop a fishing line in the water while under way if you would like to fish. Our guests have really enjoyed these tours. Pesca Vivencial has several location options. Welcome to Puerto Ayora! This walking tour shows you around the bustling port town. 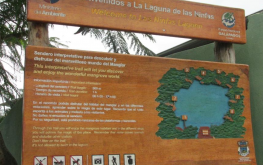 You can visit Las Ninfas. Go to the main dock and meet some of the local wildlife. See the cliffs on the way to Tortuga Bay. Learn what are the best restaurants in town. Finish off with Happy hour if you would like. This is an augmented reality museum. 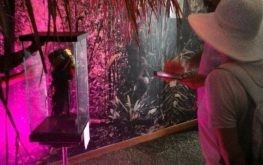 Through technology visitors can see artifacts from pre-columbian Ecuador and learn about pre-columbian culture in Ecuador. There is also the opportunity to see a genuine shrunken head. Ecuadorians are very proud of their country’s rich and diverse history. Take this opportunity to learn more about it. Isabela has the 3rd largest population in Galapagos. Our guests have enjoyed visiting Los tuneles for snorkeling. You can also view flamingos wading in the laguna in Puerto Villamil. Those that are more adventuresome enjoy the hike up to the active volcano in Isabela. When you stay at Torre Mar Galapagos you can visit Isabela as a day excursion. San Cristobal is in the eastern part of the Galapagos archipelago. This island is home to the 2nd largest population. A good choice for a tour to San Cristobal is a day of snorkeling. There are some great snorkel spots near by the island at León Dormido. Rich in Galapagos human history, Floreana Island is the first island to have a human resident. 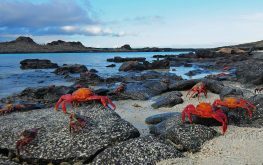 A visit to Floreana Island combines learning about the Galapagos ecosystems, wildlife, whalers, and some of the first settlers in the Galapagos. Floreana Island has the smallest permanent human population. Visitors to Floreana can visit the pirate caves, walk down the path to the loberia, and swim from the black sand beach. If you enjoy kayaking you have options to pick from in Santa Cruz. If you enjoy calm water kayaking Tortuga Bay is a great choice. The bay waters are lake calm. There are interesting cliffs to follow along. The bay hosts hungry sea turtles eating algae. You can watch as they pop up and down while they dine. 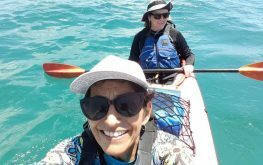 If you are more adventurous Academy Bay ocean kayaking tours can be arranged. You can view a wide array of bird and marine life along the cliff all while mastering the seas. The Galapagos Islands are ranked among the top 5 best SCUBA diving experiences in the world. Yes, as a land-based visitor you can dive by day and enjoy the comfort of your suite at Torre Mar Galapagos by night. 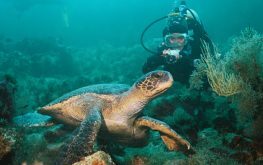 There are a wide variety of dive sites available from Santa Cruz Island. The dive sites offered from Santa Cruz give divers opportunities to see sea turtles, Galapagos sharks, hammerheads, manta rays and much more! If you are traveling with family or friends who don’t dive they can have an active itenary and experience Galapagos while you scuba dive as compared to a live aboard with not much to todo, but read a good book. 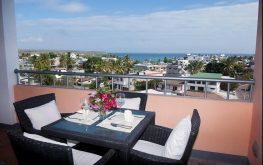 Torre Mar offers great accommodations for scuba divers. 63% of the fine aroma flavored cacao worldwide production is from Ecuador. Most of the world’s finest Ecuadorian cacao has been shipped overseas to international gourmet chocolatiers. In recent years, not all of the fine cacao is being shipped overseas. Ecuador has begun to produce fine chocolate here at home. Galapagos has produced it own home grown Chocolatier. 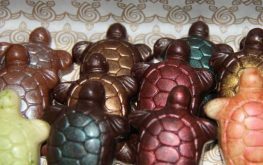 He handcrafts gourmet chocolates made from rich Ecuadorian Arriba Cacao and will show you how it is done. In recent years, coffee production in Galapagos has become a cash crop in the islands. 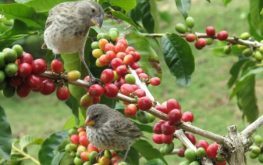 The coffee produced in Galapagos, some say, rivals Hawaiian Kona and Jamaican Blue Mountain coffees. The beauty of Galapagos coffee farming is they have taken a conservation approach to raising organic coffee. You can visit an working coffee farm and see how they have married raising quality coffee and restoring the natural environment. Highland View is a hike around a natural crater that is also a working farm. You can experience Galapagos geology and see what farm life is like in Galapagos. You can see the old fashion way of “juicing” sugarcane with a donkey powered press. To top off this unique experience there is a magical swing over the edge of the crater. All of this with a down home Galapagos flair. Cerro Mesa is a private reserve on Santa Cruz. When you visit Cerro Mesa you have the opportunity to take in expansive views from the look out point and the walking trail. You can also view the large sunken crater. For those who are adventurous, hike down inside. This is also a great location to see the second species of giant tortoise endemic to Santa Cruz Island.